REMOVE STUBBORN BLACKHEADS Remove Dry Flaky Skin on cheeks and forehead, Acne Scars, Stretch Marks, Sun Damage, Dark Spots, Dead Skin, Fine Lines & Wrinkles around eyes, and More! Most Effective Microdermabrasion Scrub on the market. MELT AWAY DEAD SKIN - Super Tiny Crystals and Natural Enzymes from Pineapple and Papaya mechanically exfoliate and literally melt away dead skin giving you beautifully resurfaced soft smoother brighter complexion. WILL NOT ABRADE SKIN - Moisturizing Cream containing Aloe Vera, Chamomile, & Vitamin E help lubricate, protect, and heal skin from over exfoliation. Will not tear skin like 99% of scrubs that contain larger coarser exfoliants. READ RAVING 5 STAR REVIEWS - Paraben Free, Cruelty Free, Fragrance Free. Environmentally Friendly/Biodegrading - No Plastic Beads that end up in the ocean. 100% Satisfaction Guaranteed. Use the whole jar for 30 days...if unsatisfied for any reason, we'll give you a full refund! 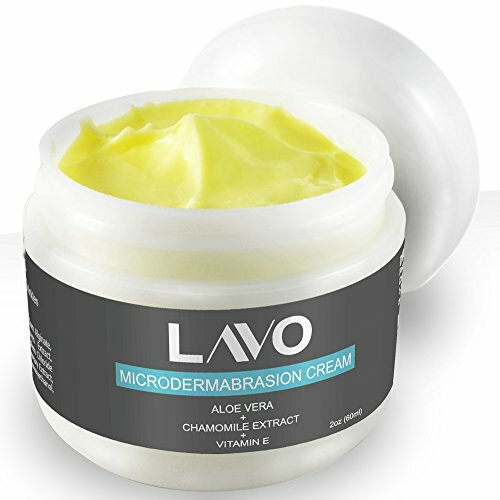 If you have any questions about this product by LAVO, contact us by completing and submitting the form below. If you are looking for a specif part number, please include it with your message.